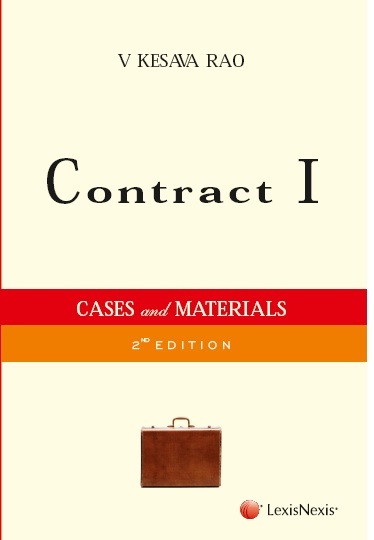 Contract I: Cases and Materials focuses on the general principles of the law of contract codified in Sections 1 to 75 of the Indian Contract Act 1872. The fundamentals of the law of contract are presented by a judicious mixture of judicial decisions, juristic comments, legal provisions and law reform reports in seven segments comprising of eighteen chapters. The conceptual framework of contract and law of contract is the realm of the first segment, while the second segment deals with the formation of a contract, the third and fourth segments respectively deal with the contracts imposed on consumers today and contracts implied by law. Segment five deals with the operation of a contract while discharge from contractual obligations and breach of contract and its attendant consequences are dealt in segments six and seven. The unique feature of the book is an exclusive focus on decisions of courts in India. Leading English cases are provided at the end of every chapter for a better understanding of the concepts and to facilitate comparison. This endeavour is with the object of fostering the development of Indian contractual jurisprudence.